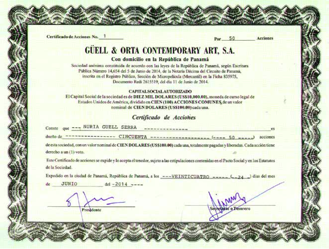 After creating an anonymous corporation (Orta & Güell Contemporary Art S.A) in a tax haven, the artists Núria Güell and Levi Orta donate the management of their company and the accompanying bank account with all its benefits to a group of activists who are developing an autonomous society project on the sidelines of the capitalist dynamics. This company allows its recipients to evade the regulations imposed by the states, which are the European Central Bank (ECB) and the International Monetary Fund (IMF), challenging the financial system monopoly and thus facilitating a free effectiveness for an autonomous economy development. The founding of the company is thus a tool for establishing a more autonomous financial system, using the contradictory mechanisms of financial capitalism as tools in the struggle against the very system those tools were designed to support. Allow users to avoid regulations imposed by states, ECB and the IMF. To analyze the contradictions inherent in copying capitalist strategies and whilst offering a tool to create anti-capitalist social dynamics. Through the bank accounts users are enabled to evade state-imposed regulations, and challenge the monopoly of the financial system, thus facilitating free operations to develop a self-governing economy.